• Congratulations, Frank: Mayor, Cr Don Hill welcomes the new member of the Council team. NEWLY elected South Gippsland Shire Council councillor Frank Hirst told The Mirrorhe was “quite surprised” to have won Monday’s count back vote. He will be officially sworn in on April 17. Called upon to give a speech, Cr Hirst told those who had gathered at Leongatha Council chambers that it was an “honour to represent the people of Strzelecki ward”. “It’s only a year-and-a-half until the next election, so if I don’t like it I’m pretty sure I can stick it out that long,” he quipped. Mayor Cr Don Hill said Mr Hirst was “an active member in the community and will be an excellent representative for the Strzelecki Ward and the Shire”. 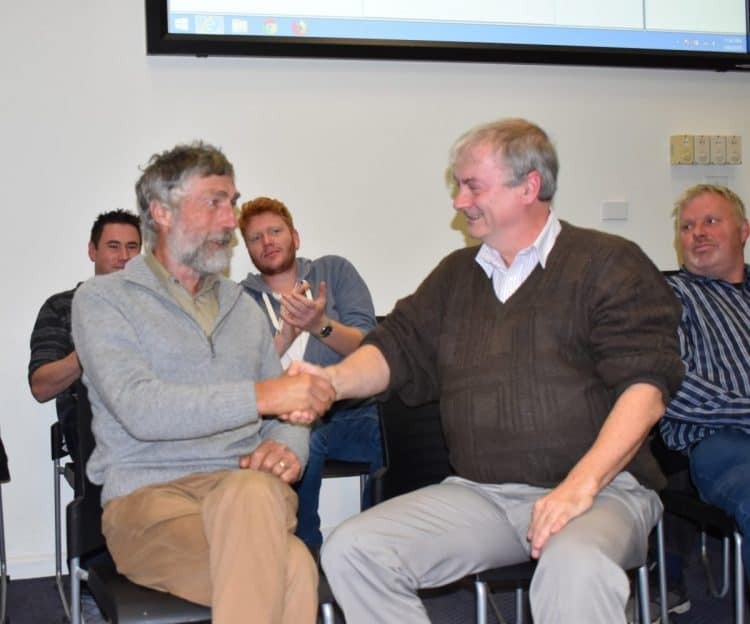 “He is heavily involved in the agroforestry network and used to work for DPI in the Leongatha office a few years ago. He is also involved in the Lions Organisation,” he said. Mr Hirst replaces former Strzelecki ward councillor Lorraine Brunt, who has quit, alleging bullying by other councillors. She is the fourth within Council to do so. Although former Tarwin Valley Ward councillor, Jim Fawcett’s position was also subject to a count back on Monday (he also quit, alleging bullying), the position was awarded to another former mayor, Nigel Hutchinson-Brooks. Mr Hutchinson-Brooks had already rejected the idea of coming back to Council when he was given the chance to replace former councillor, Maxine Kiel late last year. Mr Hutcinson-Brooks, who has also alleged bullying by sitting councillors, was phoned by the Victorian Electoral Commission’s Charmaine Morel and asked if he would accept the nomination. The phone call was short, with Ms Morel telling those who had gathered to watch the proceedings at Leongatha Council chambers, that Mr Hutchinson-Brooks was a “no”. However, under rules set by the VEC, Mr Hutchinson-Brooks will have 48 hours to reconsider. In the likely event he does not accept the nomination, it will again go to a count back – which is scheduled for today (Wednesday, April 3) at 11.00am.